It may surprise you to hear that according to a U.S. Department of Labor survey, the wealthiest Americans spend less on food and health care than the lowest 10% of income earners. At the same time, this group is investing over 16% of their income on their future, which totals around $20k a year. The low-income groups are spending more than they earn. While it may sound strange that the wealthier consumers are more conservative with their spending habits, it also might make people think about how to formulate their spending habits to match those of the higher income earners. In fact, this might be a great first step to your retirement plan. Consumer spending habits are just one important piece of the puzzle when trying to save for a wealthy retirement. There are a number of other habits of the wealthy that have put them in a financially sound position, many of which you can model to create your own wealthy retirement. Don't forget that being wealthy in retirement is about more than just a healthy bank account. It is also about being happy and healthy, staying busy, and having plenty of core pursuits. Here, take a look at the 5 best ways to model wealthy retiree behavior, and incorporate them into your life. Wealthy retirees are aware that they are going to need to count on more than just their traditional retirement plans to live comfortably and relatively free of financial worry. It is no longer feasible to think that living off your Social Security benefits and your 401(k) and IRA balances are going to provide enough to retire wealthy. A recent Vanguard study highlights the differences between a traditional retiree and a “new” retiree. With the traditional model, retirement incomes are comprised of a combination of Social Security and benefit pensions. But the new retirement model shows that income can be generated through real estate investments, business accounts, taxable investment accounts, bank accounts, and guaranteed insurance products. It’s already been proven that the wealthiest earners in America spend far less of their income on a home than the lower income brackets do. Just because you can afford the sprawling mansion doesn’t mean it’s the best decision for you and your future. Living in a modest home that you can pay off before retirement will assure you financial freedom you can’t beat. Again, wealthy Americans are living below their means and keeping their spending in check. According to the same U.S. Department of Labor survey as noted above, as consumers become wealthier, their spending habits often change quite drastically. Look at your money as freedom and opportunity. Having money to pay off your debts brings a new level of comfort when you’re retired and ready to enjoy everything your hard work has earned. Power savers put away 20% of their income into savings and pay about 30% in taxes, which leaves half of an income to live on. Continually remind yourself that the purpose of saving and decreasing your debt load is to put you in a position to do what you’d like in retirement, whether it’s travel, pursuing your passions, or spending time with family. It’s a fact that wealthy retirees have diverse forms of investments and income as opposed to just traditional retirement plans. You might have trouble deciding on the types of investments you want. To help you out, first, decide on the type of life you hope to live as you enter retirement. Do you want to manage rental properties? Do you want to continue working part-time or take on freelance work? Answers to these questions will help you determine some of the other incomes you can bring in as a retiree and the types of investments that will work for your lifestyle. A five-year study of 350 people from all income levels was conducted to show the differences in how various incomes brackets live. The study found that the wealthy filled their time with acts of self-improvement like fitness, reading, and writing, and putting together a daily to-do list that they then completed at least 70% of by the end of the day. Wealthy retirees also focus on core pursuits. Find hobbies, enjoy your grandchildren, and determine your purpose. 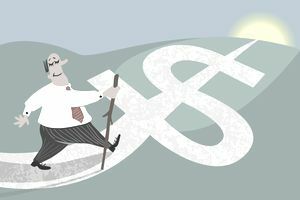 Being wealthy in retirement is not out of reach, and by modeling some of the behaviors of higher income earners, you too can be well on your way.